Imbibing on airplanes is generally as miserable as it is necessary—you never need a stiff drink more than when you're sitting between a crying baby and what may be the actual Sasquatch. But at 30,000 feet, there’s rarely anything but mini bottles of Smirnoff and Bacardi to ease your pain. 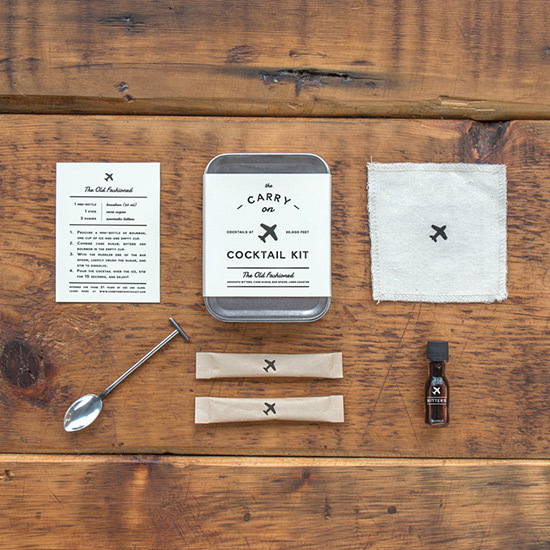 Enter The Carry-On Cocktail Kit from W&P Design and the online drinks publication Punch. Small enough to sneak into any shoulder bag, it has everything you need for a true old-fashioned: Demerara cane sugar, small-batch aromatic bitters, a nifty combo spoon-muddler, a recipe card to instruct you, and even a classy linen coaster to display your cocktail in the manner it deserves. All you need to add is booze and ice. Some airlines will sell you decent brands like Woodford Reserve, which will do just fine, but know this: Those mini bottles are under the TSA's three-ounce liquid limit, so feel free to carry on your own liquor. The tiny bottles aren't limited to the big brands, either. We've seen the likes of Blanton's Single Barrel and Wild Turkey Rare Breed in miniature form. You might have to hunt a bit, but no effort is too large for a dedicated cocktailian. Now, sip your old-fashioned and ignore the covetous stares of that guy in 23B.